Rothenberg is one of Germany's three great walled cities. Also check out Dinkelsbühl and Nördlingen. 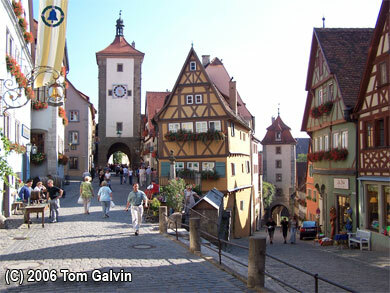 Rothenburg ob der Tauber was one of Germany's grandest tourist attractions, a little city that had everything. Fantastic Gothic and Baroque architecture, an almost-fully intact old city wall, and some of southern Germany's most colorful festivals. Located right off Autobahn 7, it was very accessible, which made it a more lucrative tourism draw than other similarly-preserved locations like Dinkelsbuehl. ridge jutting out over the beautiful, and undeveloped, valley. Between us, we had made seven trips to Rothenburg, and pretty much combed the entirety of the downtown. Despite expanding this travelogue to three chapters in 2006, including two photo galleries, this travelogue does not cover everything. There was simply too much in Rothenburg to cover it all here. Unlike other travelogues in this site, the chapters were not divided according to geography. They were divided as best described the experiences that visitors would find. The map at right provides links to the chapters. The first chapter, titled Obere Schmiedgasse, covers what nearly all tourist would hit on their first (and likely only) visit. It covers the city's two main streets -- Herrgasse and Obere Schmiedgasse, that formed an 'L' meeting at the central market square. This square was dominated by the town hall, and its 200-foot tall Imperial Tower. The bulk of the specialty shopping, ea ting, and activities fell along these streets (although there was certainly plenty all around the city). The second chapter, titled Festive Rothenburg, covered the great festivals that took place all year in the city. One of the greatest things about Rothenburg was the fact that on any given day, one could encounter something going on. Traditional festivals happened about one weekend a month, and sometimes planned celebrations happen the whole month. Of our seven visits, three were accidentally during an event of some kind. 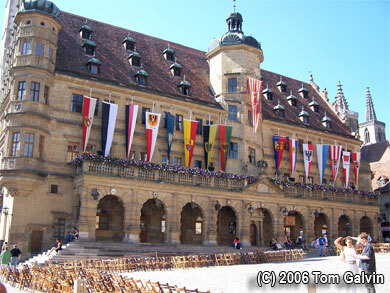 As the photo gallery in this chapter shows, when Rothenburg held a festival, it went all out. The third chapter explored the City Wall, a thirty-foot tall structure that encircled the entire old city. The wall had been largely reconstructed, with plaques on the inside honoring the many who contributed monetarily to its rebuild. There was a walkway that was easily high enough to provide an excellent view of the surroundings. Also, several of the outer towers are themselves full-blown fortresses that can be explored from the inside. For example, the Spitaltor in the east has a round tower manned with cannons. This photo gallery shows a number of the fantastic fortifications in the city. Despite all our trips there, we have never gotten tired of Rothenburg. It iwas such a colorful and enjoyable town, a great place to visit. For those making their only trip to Germany in this lifetime, this little city should be on the itinerary.